QUEENSRYCHE needs no introduction to the Metal/Prog Metal community, but I will provide one anyway. They released their debut EP in 1982 and were one of the original pioneers of Progressive Metal. I was faithfully with them (tri-ryche tattoo and all) until the “Hear in the Now Frontier” album when I think they lost direction. But when Tate was finally ousted and Todd LaTorre ushered in as lead vocalist, my curiosity was peaked once again. I had the pleasure of reviewing his debut with the band a couple years ago and was quite impressed with their invigorating comeback. It is with great honor that I am able to review this new album, “Condition Human,” which contains twelve tracks. “Arrow of Time” wastes no energy coming right at you with a twin guitar harmonic guitar and hasty message. Todd once again sounds amazing. It is really uncanny how much his tone and range mirror’s the band former singer, yet I find his vocals a bit thicker which rounds out the sound more for me. “Guardian” is a darker, more suspenseful song which hears some really high vocal parts that pierce through you, leaving goosebumps on your arms. The chorus is all out with harmony and emphasis. “Hellfire” is a mid-tempo song that walks a delicate line between the misty, subdued opening, minor chord progressions and the melody that shines brightly in the chorus. “Eye9” follows an opening bass riff forward into a marching, powerful sound that creeps towards you like a swirling clouds of spirits in a cemetery. “Bulletproof” is song that takes me back to the band’s earlier work. It’s an emotion filled song that plays off the delicate melody of the acoustic guitars, and the vocal harmonies in the chorus. I like the diversity that this song brings to the album. “Just Us” affirms the band’s commitment to writing their way and for no one else, which has always been a core element of their sound. It’s a unique sound that is both deep and broad, circling just within your reach and surrounding you with a warm light. This is a fantastic song. “The Aftermath” is a moody and foreboding song that lurks in the shadows leading to the closing title track, “Condition Human,” which is also the longest song on the album. 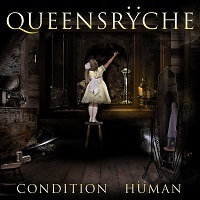 It has an epic quality to it, like some of the classic QUEENSRYCHE songs they composed early in their career. Here the Prog elements take center stage, and this is surely to go down as a classic song in the band’s repertoire. Overall, compared to earlier works I find the Progressive elements do not overtake the accessibility of the music in general. In other words, you can more easily connect with the songs than having to worry about taking in some overly complex material than can be hard for fans who aren’t into or can’t understand Progressive Metal, for those very reasons. I think what this album has shown more than anything else is that if you fell asleep on this band in prior years, it’s time to wake up and join back up with them, because they clearly still have a lot left in the tank.